Let me start by saying I’m not a huge fan of snow–the majority of my dislike towards the tiny frozen particulates stem from my inability to drive in it. When it snows, the roads get messy, making your car messy and more difficult to keep everything clean. Tonight, however, I was reminded, how almost magical snow makes things. A clear, midnight blue dark sky, stars spattered across the sky, the moon out with no clouds to hide behind. 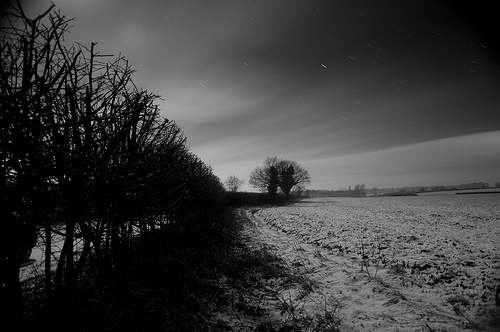 A farmers field, once the place of wheat or hay, now barren, except for a layer of crisp, white, snow, glittering from the moonlight. A farmers road, never driven on or walked upon, with only the small traces of animal tracks criss-crossing all over the fresh white layer of glistening layer of purity. You don’t need your headlamp to run, because the snow reflects the sky. You don’t need music. The whistling of the wind is enough to keep your mind at bay. Your breathing is labored, but oddly that night, each breath comes without difficulty. Everything is calm. You have no distractions. It’s only you, in a barren field, running, with the snow crunching under the force of each footstep. You’re leaving your footprints; your mark in the world. No one may ever discover them. The snow may melt before they are seen. But you know they are there.